For the people that know me, they’d probably be shocked to hear I welcomed some of the traffic today. It gave us a longer time to enjoy the A/C and less time with the mobs of people. I was stunned to see how many Chinese tourists visited these sites. Now that the Chinese have been allowed to travel, they are making the most of it. They pose with their selfie sticks in every corner of the famous places. I’m thankful my friend Page joined me for sightseeing today. Her fascination with silks and needlework has lured her to China many times, so she has already seen many of the sites. I felt better when I had learned she had not been to the Temple of Heaven. At least that wasn’t a repeat for her. The Temple of Heaven, also known as Tian Tan, was completed during the Ming dynasty. It is one of the largest temple complexes in China and is designated a UNSESCO World Heritage Site. It was here that the emperor would pray to heaven and his ancestors at the winter solstice. On behalf of his people, who were not allowed to visit the temple under the Ming and Qing dynasties, he would ask the gods for a good harvest. The main parts of the temple complex are connected on the favored north-south axis. After watching the local men exercise on the parallel bars and swing by their elbows on the high bar while the women massage their backs and calves on rollers, and play hacky sack (really well I might add) in their dresses, we followed the raised, covered-walkway to Qinian Dian, the Hall of Prayer for Good Harvest. Lining the walkway were women crocheting, groups playing cards, and men playing chess. Locals could purchase a year pass for $20, so many enjoyed all aspects of the park. The Qinian Dian, built in 1420, is made entirely of wood without using a single nail. Its round altar is made of stone slabs in multiples of nine, the Chinese lucky number. The Marble Platform which surrounds the Hall of Prayer for Good Harvest is 90 meters in diameter and the three tiers each have nine steps. The balusters on the upper tier are decorated with dragon carvings which symbolize imperialism. I really enjoyed our first Beijing attraction, the Temple of Heaven. Located on the southeast side of Beijing inside the 2nd ring road, however, we had a long way to the Northwest side of town. We drove very slowly while honking regularly at anyone in the way to the Summer Palace. Either in my wishful thinking or naivety, I thought its distance from the main city center would offer some tranquility. Boy was I wrong! This complex was packed! Fortunately, after we squeezed through the entrance and the Long Corridor decorated with over 14,000 different paintings, the crowd thinned. The Summer Palace served as a retreat for the Qing dynasty from the stifling summer confines of the Forbidden City. Hmmm, I didn’t find it terribly cool. Anyway, the palace is most associated with Empress Dowager Cixi as she had it rebuilt twice: once following its destruction by the French and English in 1860 and again in 1902 after the Boxer Rebellion. Cixi was one of China’s most powerful women. Once an imperial concubine, she paved the way for the fall of the Qing Dynasty in 1911. The crowds thinned even more after we paid extra to climb up Longevity Hill to the Tower of the Fragrance of the Buddha. The hill is peppered with a variety of religious buildings, and it offered a nice view of the man-made lake, our next stop. 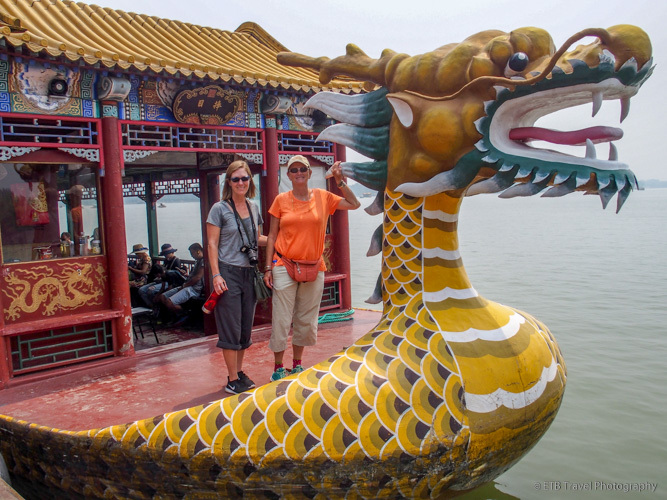 At the lake, we passed by the marble boat (wood painted to look like marble) that Cixi funded with money meant for the Imperial Navy, on our way to the Dragon Boats. We boarded a dragon boat which took us past several pedal boaters enjoying Kunming Lake to a different entry/exit point where our driver picked us up to take us to our final destination, The Forbidden City. Uniquely, Page’s last visit to the Summer Palace didn’t include the hike up Longevity Hill and because she visited in the fall, no boats were on the lake, so despite her repeat visit she got a new experience! On the way to The Forbidden City in the heart of Beijing, we stopped off for lunch at Qin Men, another authentic restaurant chosen by Jason. He ordered for us and we had a feast! The food just kept coming…noodles, kabobs, eggplant and more. Surprisingly, the eggplant was my favorite. I was very excited to see The Forbidden City as I had heard so many amazing things about it. I’m not sure if it was the high expectations or the fact that I had recently seen similar structures in Seoul that made it less impressive to me. I certainly don’t wish to take anything away from China’s most magnificent architectural complex as I’m certain it represents significant history and is very special. But by the end of the day, a quick hour stroll through the courtyards and around its buildings loaded with visitors was plenty for me to get a taste of the place where 24 dynasties ruled for 500 years until 1912. I suppose I should feel lucky I could visit given the complex was only opened to the public in 1949. The Forbidden City was also constructed in 1420 and is on the favored north-south axis. Entry is only allowed from the south through the Meridian Gate and exit is only allowed to the north which helps the flow of traffic. The Meridian Gate is where the emperor would review his armies and perform the new year celebration. From the Meridian gate entry, we passed across the Golden Water moat along one of the five bridges which symbolized the five virtues of Confucianism. To the left of one of the many courtyards, was an outer building full of presents given to one of the emperors for his 60th birthday. Here we enjoyed the air conditioning and admired many porcelain vases and platters. Most were adorned with or in the shape of a peach, a symbol of longevity. Our next stop in the Forbidden City was the Hall of Supreme Harmony, the largest hall in the complex. This was used for major occasions such as the enthronement for the emperor. Large bronze cauldrons were filled with water to protect the building from fire. In addition, an odd number of figures associated with water were carved on the roof to protect the palace from fire. Keeping with odd numbers and the number nine, it is said that the Forbidden City has 9,999 rooms. In addition, its doors are decorated with 81 brass studs in a 9×9 design, an especially fortunate formula. Interestingly, while Page had already visited the Forbidden City, she had never seen the birthday gifts for the emperor. Instead she saw the dragon wall which we skipped as it was some distance from the exit and we, along with our guide, were ready to end the day. After a long day of Beijing sight-seeing, this evening we decided to go in search of Peking Duck. Jason wrote, “Please take us to Hua’s Restaurant” in Chinese, so we could hand it to our taxi cab driver. Friday rush hour proved a challenge to get a cab, even for our bellmen. As a result, they ordered a car for us on their phone. The app was similar to our über only people bid for rides. We bid a higher amount in order for them to pick us up and paid in cash upon arrival. The driver took us to restaurant row. We sifted through the mobs of people to reach the restaurant entrance through a long hallway. We were surprised to find that boiled crawfish was the popular order. Perhaps they were in season in June in China?!? We stuck with the duck and ended up with a table full of food for a nice meal. Want to Take this Post With to Read Offline Later? The Great Wall of China…A Must See! Previous Post The Great Wall of China…A Must See! I see the Forbidden City has not changed much since my visit. China is still the most fascinating place I have been so far…It’s like going to another planet!